Nithu's Kitchen : Tell us about you Akila. Akilandeswari : I am a Software Consultant working in Singapore and a Mother of two kids, one is 4 yrs (boy) and one is 11 months(girl). I finished my Masters in Communication Engineering but as many people do, I too switched to computer field. Before coming to Singapore, I worked as Lecturer in Engineering college. Nithu's Kitchen : What are your interests. Akilandeswari : I like shopping, most of the times window shopping;-), playing with kid (I always feel I too have become a kid whenever I play with them:-)) and trying new recipes at my kitchen. Akilandeswari : After my wedding, I had to depend on the net for different recipes as I was a newbie to kitchen by then. While, searching for recipes I stumbled up on various blogs. I too wanted to have my own blog but at that time I could not do that for few reasons. After a couple of years, I started my blog and this is my full time hobby now. Nithu's Kitchen : How old is your blog and how many posts you have now? Akilandeswari : My blog will be 6 months old soon and there are totally 132 posts. Nithu's Kitchen : What cuisine does your blog focus? Akilandeswari : My blog's main focus is on Indian Cuisine(South and North Indian). I am yet to try International and fusion dishes. For the time being, I am just concentrating on Indian dishes alone, as Indian cuisine itself has thousands of varieties to try out. Nithu's Kitchen : Why did you select your blog name as "Learing-to-cook"? Akilandeswari : I just started to cook only after my marriage and from that time, till now, whatever mistakes I do in cooking, I learn some lesson out of it. That is why I chose the title "Learning-to-cook". Nithu's Kitchen : Whom you consider as your best critic? Akilandeswari : To be honest, the best critic is myself. Because, I always want my dishes to taste great and I do analyse if my dish doesn't taste so good.Most of the times I rectify the fault in the dish to make it taste better. My parents, husband and my kids would always say that my cooking is very good, just out of their love for me even it does not taste so good. That is why I say, I'm the best critic for my cooking. Nithu's Kitchen : What do you have today to share with us. Why did you select this today. Akilandeswari : I would like to share the Urundai kuzhambu recipe which is one of my favorites. 1. Soak the Channa dhal and thoor dhal for 1 to 2 hrs. 2. Grind the dhalls and the other ingredients in I to a coarse paste. 4. Steam cook the balls in a idli cooker and keep aside. 5. Now for preparing kuzhambu, add oil in a pan. 6. When it is hot, add the cumin seeds, fenugreek seeds and when they start spluttering, add th onions, green chilli and garlic. 7. When the onion turns brown colour, add the tomato and curry leaves. 8. When the tomato becomes soft, add the tamarind juice, salt, turmeric powder, chilli powder and coriander powder and boil for 10 mts or the gravy becomes thick. 9. Add the grated coconut and cook for another 2 mts. 10. Now add the steamed balls and cook for just 2 to 3 mts and switch off the stove. 11. Garnish with cilantro and Serve hot with rice or chappathi. Nithu's Kitchen : Thank you so much Akila. We enjoyed talking to you. 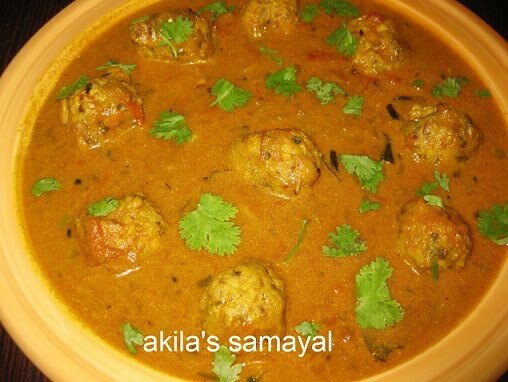 Friends, Hope you all love Akila's delicious Paruppu Urundai Kuzhambu. If you are interested to be featured as Nithu's Kitchen's Guest, please drop a mail to nithuskitchen[at]gmail[dot]com. Hy Akila, great to know more abt u. Like to read your guest posts. This time it's nice to know a bit about Akila who makes great stuff. Love the Kuzhambu recipe. Good interview and a good recipe too. Thank you Nithu for letting us know more about Akhila. Kulambu looks inviting..
Great post and good to know about Akila! Best wishes and congrats to you too Nithu! nice to know abt Akila..good recipe too..
wow..wonderful interview, and nice answers akhila, thank u nithya for interviewing akhila. Glad to know more about Akila, already following her blog and love her recipes. All the best for your bourbon biscuits to win the contest! Thanks for hosting this opportunity to know fellow bloggers - that is one tasty urundai kozhambu! I like ur new profile looks too..
We all [url=http://www.chanelsalesonlineoutlet.com/]Chanel Bags[/url] know that a real Chanel Handbags - http://www.chanelsalesonlineoutlet.com/ designer Chanel Bags Sale handbag is Chanel Handbags very expensive. Chanel Bags Sale One is for its materials. They use high quality leather or canvas which should be free of damage. The attached hardware such as the lock has the best quality.The second is for its workmanship. The seams of a real designer bags are actually sewn and not just glued together. High quality zippers, snaps and latches are also used. The lining is well made and sewn into place without wrinkles. The third is for its status. But a bag of more than a grand is still quite a strong pill for most ordinary people. However, there are some very well made replica handbags which cost much lower or even half price of the real one. In fact they are so well made that it may be tough for the untrained buyer to spot a replica bag.First, quality replica bags are made of the same leather and canvas that are used to make real designer bagsSecond, high quality replica bag has all of the marks of good workmanship that mentioned above.Third, you will also find the designer's logo attached to the replica bags. In many cases, it will take a very well trained individual to tell whether or not the logo on your bag come from the original designer.Forth, a real designer bag has a production number stamped inside to ensure that the bag is an original. It will let the buyers to know that the bag was made with caution. But you will also find a unique number inside the well-made replica bags. These bags were also made with care and caution,Messenger Chanel Black embellished flowers and used are an amazing design option for Spring season. Pink and red, dark and Mulberry coloring mixture are exceptional and bag and feminine bow details, undoubtedly include festive touch.